This is a simple plain-trick game, suitable for children. It seems to be played mostly in Britain, and is often called by the alternative name Trumps. Any number from two to seven may play. A session consists of seven hands, of diminishing size. 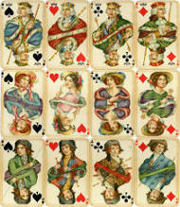 A 52-card pack is used, with four suits ranking from high to low A K Q J 10 9 8 7 6 5 4 3 2. A player is selected to deal, and deals seven cards each, clockwise. The uppermost of the undealt cards is turned face upwards to indicate the trump suit.